Although “culture” is often used while discussing law firms, the term is rarely defined and its meaning is even less frequently understood. Culture captures a law firm’s foundational values, regular business exercises, and daily practices. The people of a law firm are a critical component to its culture. However, it can also be seen in a firm’s strategies, priorities, performance expectations, and clients. A firm’s culture is essentially the law firm’s compass. If it is broken, the firm can veer off-course, leading to a stagnant business environment, or worse, stunt attorney development. However, when firm culture is strong, it energizes its attorneys and fosters their growth and success. When evaluating your current firm or a potential lateral move, there are several important factors to assess: quality of attorneys, branding, platform, strength of relevant practices, rate compatibility and compensation. At the end of the day, however, the most crucial element in your analysis is the firm’s culture. Working in a firm that you are not aligned with is like swimming against the stream. It takes a lot of work, it’s exhausting, and you won’t get very far. As a legal recruiter, I speak to people considering a lateral move every day. When I ask them why they are looking to change firms, many times they tell me it is because of compensation, the management, or lack of opportunity for growth. The true underlying cause of these issues is that they are not well matched with the culture of the firm. The stated reasons are simply symptoms of the real problem – poor cultural fit. In this ever-evolving legal market, we see many firms merging and acquiring groups of attorneys, and modifying strategies, target clients, and delivery of services in response to the legal economy. As a law firm or individual practice changes, so will its culture. Many partners have practices that are vastly different in profile and size than they were five years ago, and what once was a great fit for an individual or group may not be any longer. While individuals may still independently build successful practices in this environment, their potential will be significantly limited by the cultural environment. To truly determine if a firm is a great fit for you, you must first gain awareness of what your professional values, beliefs, and best strategies are for you and your clients. The firm that is the best fit for you culturally may or may not be the most profitable, the most prestigious, or the largest firm. While a firm may “check all the boxes,” you will also want to ask yourself, do I personally match up with the firm’s people, business practices, and strategies? Are my practice and my clients central to the firm’s practices or an outlier? Are my practice and my clients’ needs current areas of strength of my firm? What is my firm’s growth strategy and is my practice a priority in it? Do my clients align with the firm’s top clients? What are my work preferences and do they match up to firm policies? There is no one right answer to any of these questions but the closer your values and beliefs match with the firm’s, the stronger the likelihood of ultimate success for you and your practice. How Do I Assess a Firm’s Culture? There are signs to look for when trying to decide if a firm’s culture is a potential fit. It’s important to understand that there are always two cultures at play. You must be cognizant of both types of culture and the prevalence they have on the firm you work in or the one you are looking to join. Culture by Construct is the culture to which the firm aspires and is usually detailed in the values, mission statements, and growth strategies. This type of culture should be well-articulated and be the unifying force throughout all offices. When considering your firm, or a firm you may join, decide if you align with these stated goals and if these values are present and actively cultivated by the firm. If you align with the goals but don’t see them consistently executed by the firm in their policies and business practices, that is a red flag. Culture by Chance is the culture that develops through legal and non-legal staff interactions. Each office will have a different culture that develops organically, which is acceptable as long as the firm’s Culture by Construct ultimately prevails in all its offices. However, if the Culture by Chance is stronger than the Culture by Construct, this is a red flag, and you will likely have fragmentation between the offices ultimately causing lateral departures and low morale. Regularly evaluating your personal and practice fit with your firm is imperative. Consider it as part of a self-initiated annual review for the benefit of your clients and practice. Be thorough and consider all relevant factors including your relationship with your partners and colleagues but don’t let familiarity keep you at a firm that does not provide a good cultural fit. You must also analyze your practice and personal fit with the many other pieces of the firm’s Culture by Construct and Culture by Chance. The key question to ask yourself at the end of your evaluation is: Am I swimming against the stream or with it? Be thorough in your interviews. 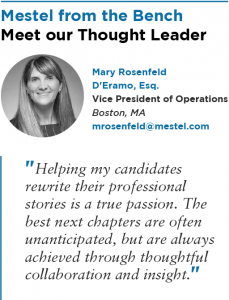 A firm’s interview process is the best way to gain insight into the firm. There are several ways to improve your interview process to get a better understanding of the culture. Vary the format of the interviews. It is best to have a variety of types of interviews. I would suggest: one-on-one, group, and off-site (lunch/ dinner or coffee) interviews. This will allow you to have in-depth conversations, watch partner interaction, and build an understanding of the culture. Have repeat interviews. Try to meet some partners more than once. You will begin to build personal and professional connections, and slowly become integrated into the firm during the interview process and will get a clearer picture of the culture. Vary the departments and office locations. Meet with partners in various departments and practice groups of the firm. This will give you a holistic view of the firm’s culture by construct and culture by chance. Meet recent laterals. Recent additions to the firm will be very helpful in ascertaining firm culture. They can provide a different perspective on the firm’s culture, transition process, and business expectations. Ask for examples. When you are meeting with attorneys, don’t be afraid to ask partners to describe the firm culture to you. Be aware of inconsistencies and variations. Follow up and ask for real life experiences as well as policy examples. Understand the firm’s clients. Clients tell you a lot about a firm because, at the end of the day, a law firm provides services for and caters to their clients. When reviewing this list, analyze how your clients fit into this roster. Drill down on expectations. Understand how the firm’s procedures, business practices, institutional policies, and everyday performance expectations exhibit the stated cultural values of the firm. When attorneys share a strategic vision, approach, and focus, and when they all feel valued and are united towards common goals, magic can happen. Productivity goes up, passion increases, opportunities arise, and the energy becomes palpable. Why? Because an authentic sense of shared professional values lends itself to success. The most successful partners tend to be at firms where they like and respect each other and where they are all working towards a common goal. The most successful firms are those which clearly define their culture, and ensure that its internal policies enforce those core cultural values and goals. In these firms, you are able to work and collaborate harmoniously with fellow partners and can, therefore, spend time and energy on things that invigorate you, your team, and your collective practice. You are no longer swimming upstream, but are going with the flow which allows you to go farther and faster, allowing your practice to take off. When it comes to deciding the right law firm, do not discount the importance of culture. Be bold, ensure the best fit for you and your practice, swim with the stream, and achieve your maximum potential.